The Princess and the Pea is a traditional story of the prince who is given the best of everything. 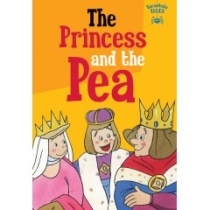 When the princes family decide it is time for the prince to get married, they invite many suitable princesses and young charming women to meet the prince, but none of them is princess-perfect enough for him. Then one day a poor girl, bedraggled by the rain and life, appears at the castle door, and she is invited to stay. She has a terrible nights sleep, which proves to the family that the princess is indeed princess enough to marry the prince. What is the key to their discovery? You need to read the book to find out! This is a fun, well-told, happy story with lovely illustrations.